Consuming fructose increases your hunger and desire for food more than glucose, the main type of sugar found in starchy foods (3). Additionally, excessive fructose consumption may cause resistance to leptin, an important hormone that regulates hunger and tells your body to stop eating (4). Research has consistently shown that people who drink sugary beverages, such as soda and juice, weigh more than people who don’t (5). Also, drinking a lot of sugar-sweetened beverages is linked to an increased amount of visceral fat, a kind of deep belly fat associated with conditions like diabetes and heart disease (6). SUMMARYConsuming too much added sugar, especially from sugary beverages, increases your risk of weight gain and can lead to visceral fat accumulation. High-sugar diets have been associated with an increased risk of many diseases, including heart disease, the number one cause of death worldwide (7). Evidence suggests that high-sugar diets can lead to obesity, inflammation and high triglyceride, blood sugar and blood pressure levels — all risk factors for heart disease (8). Additionally, consuming too much sugar, especially from sugar-sweetened drinks, has been linked to atherosclerosis, a disease characterized by fatty, artery-clogging deposits (9). A study in over 30,000 people found that those who consumed 17–21% of calories from added sugar had a 38% greater risk of dying from heart disease, compared to those consuming only 8% of calories from added sugar (10). SUMMARYConsuming too much added sugar increases heart disease risk factors such as obesity, high blood pressure and inflammation. High-sugar diets have been linked to an increased risk of dying from heart disease. Sugary foods quickly spike blood sugar and insulin levels, causing increased androgen secretion, oil production and inflammation, all of which play a role in acne development (12). Studies have shown that low-glycemic diets are associated with a reduced acne risk, while high-glycemic diets are linked to a greater risk (13). For example, a study in 2,300 teens demonstrated that those who frequently consumed added sugar had a 30% greater risk of developing acne (14). Also, many population studies have shown that rural communities that consume traditional, non-processed foods have almost non-existent rates of acne, compared to more urban, high-income areas (15). SUMMARYHigh-sugar diets can increase androgen secretion, oil production and inflammation, all of which can raise your risk of developing acne. The worldwide prevalence of diabetes has more than doubled over the past 30 years (16). Obesity, which is often caused by consuming too much sugar, is considered the strongest risk factor for diabetes (17). A population study comprising over 175 countries found that the risk of developing diabetes grew by 1.1% for every 150 calories of sugar, or about one can of soda, consumed per day (18). Other studies have also shown that people who drink sugar-sweetened beverages, including fruit juice, are more likely to develop diabetes (19, 20). SUMMARYA high-sugar diet may lead to obesity and insulin resistance, both of which are risk factors for diabetes. First, a diet rich in sugary foods and beverages can lead to obesity, which significantly raises your risk of cancer (21). Furthermore, diets high in sugar increase inflammation in your body and may cause insulin resistance, both of which increase cancer risk (22). A study in over 430,000 people found that added sugar consumption was positively associated with an increased risk of esophageal cancer, pleural cancer and cancer of the small intestine (23). Another study showed that women who consumed sweet buns and cookies more than three times per week were 1.42 times more likely to develop endometrial cancer than women who consumed these foods less than 0.5 times per week (24). SUMMARYToo much sugar can lead to obesity, insulin resistance and inflammation, all of which are risk factors for cancer. 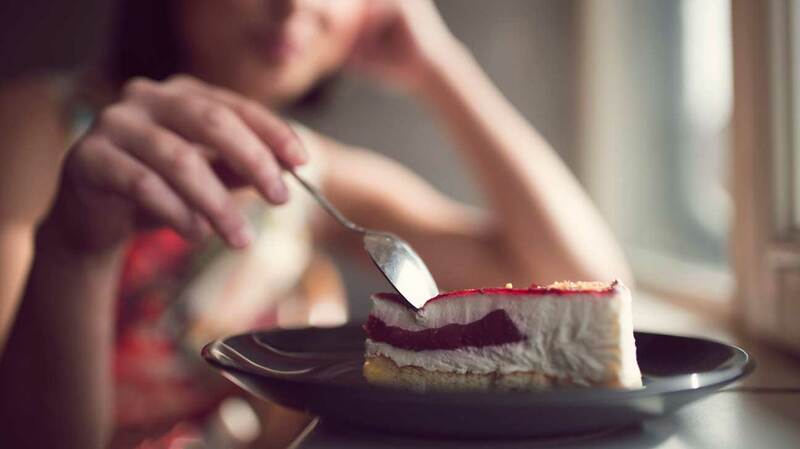 Consuming a lot of processed foods, including high-sugar products such as cakes and sugary drinks, has been associated with a higher risk of depression (25, 26). Researchers believe that blood sugar swings, neurotransmitter dysregulation and inflammation may all be reasons for sugar’s detrimental impact on mental health (27). A study following 8,000 people for 22 years showed that men who consumed 67 grams or more of sugar per day were 23% more likely to develop depression than men who ate less than 40 grams per day (28). Another study in over 69,000 women demonstrated that those with the highest intakes of added sugars had a significantly greater risk of depression, compared to those with the lowest intakes (29). SUMMARYA diet rich in added sugar and processed foods may increase depression risk in both men and women. Advanced glycation endproducts (AGEs) are compounds formed by reactions between sugar and protein in your body. They have been found to play a key role in skin aging (30). Consuming a diet high in refined carbs and sugar leads to the production of AGEs, which may cause your skin to age prematurely (31). In one study, women who consumed more carbs, including added sugars, had a more wrinkled appearance than women on a high-protein, lower-carb diet (32). The researchers concluded that a lower intake of carbs was associated with better skin-aging appearance (32). SUMMARYSugary foods can increase the production of AGEs, which can accelerate skin aging and wrinkle formation. As you grow older, telomeres naturally shorten, which causes cells to age and malfunction (33). Consuming high amounts of sugar has been shown to accelerate telomere shortening, which increases cellular aging (34). A study in 5,309 adults showed that regularly drinking sugar-sweetened beverages was associated with shorter telomere length and premature cellular aging (35). In fact, each daily 20-ounce (591-ml) serving of sugar-sweetened soda equated to 4.6 additional years of aging, independent of other variables (35). SUMMARYEating too much sugar can accelerate the shortening of telomeres, which increases cellular aging. Products that are loaded with sugar but lacking in protein, fiber or fat lead to a brief energy boost that’s quickly followed by a sharp drop in blood sugar, often referred to as a crash (36). Having constant blood sugar swings can lead to major fluctuations in energy levels (37). SUMMARYHigh-sugar foods can negatively impact your energy levels by causing a spike in blood sugar followed by a crash. Large amounts of added sugar in the form of fructose overload your liver, leading to non-alcoholic fatty liver disease (NAFLD), a condition characterized by excessive fat buildup in the liver (38). A study in over 5,900 adults showed that people who drank sugar-sweetened beverages daily had a 56% higher risk of developing NAFLD, compared to people who did not (39). SUMMARYEating too much sugar may lead to NAFLD, a condition in which excessive fat builds up in the liver. Increase kidney disease disk: Having consistently high blood sugar levels can cause damage to the delicate blood vessels in your kidneys. This can lead to an increased risk of kidney disease (40). Negatively impact dental health: Eating too much sugar can cause cavities. Bacteria in your mouth feed on sugar and release acid byproducts, which cause tooth demineralization (41). Increase the risk of developing gout: Gout is an inflammatory condition characterized by pain in the joints. Added sugars raise uric acid levels in the blood, increasing the risk of developing or worsening gout (42). SUMMARYConsuming too much sugar may worsen cognitive decline, increase gout risk, harm your kidneys and cause cavities. Fortunately, simply focusing on eating whole, unprocessed foodsautomatically decreases the amount of sugar in your diet. SUMMARYFocusing on preparing healthy meals and limiting your intake of foods that contain added sweeteners can help you cut back on the amount of sugar in your diet.